I think most of us can say with a fair amount of authority that the Diamondback’s new uniforms are well, terrible. Many were not fans of them bringing back the bright blue. Taijuan “Skywalker” Walker heard the hate and decided to put an end to it once and for all. The Vapor line of Nikes has always been fresh, but this year’s model is off the chart. The blue is very reminiscent of Nolan Arenado’s model that he got at the beginning of 2017 Spring Training. You can shop the Vapor Ultrafly Pros at the link. 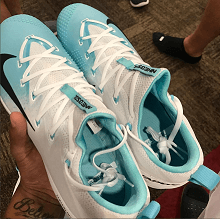 Categories: Arizona Diamondbacks, Taijuan Walker, Gear, Cleats, Pitcher.